I was first introduced to "Seven Layer Dip" in 1995 and I immediately fell in love. With the DIP! Not anyone near the dip. or a dippy person of the male persuasion. sheesh. I had made friends with a Wisconsinite who made this dish for a party. Wow! It had salsa, guacamole, cheese, more cheese, beans…. I couldn’t believe how yummy it was and I found myself standing next to it and shooing everyone else away. Since it is 2015, I no longer need seven layers. I don’t need dip either but I still love it. To make this dip healthier than the usual, I used much less cheese and dropped the sour cream entirely. I found it was flavorful without any sour cream, though purists will have an issue with this choice. If you are keeping it fresh for a party, squeeze some lemon juice on the avocado so it doesn’t turn brown. For a spicier version, add some sliced jalapenos to the top – yum! Because I was feeling super lazy, I used my microwave to heat it up. The whole thing took around 10 minutes and I believe it was gone in five. ahh well. Use this dip as a topping for rice or use chips, veggies, or pita wedges to scoop it up. Have you tried to make layered bean dip? How do you keep it healthy? Drain and rinse beans. Mash them in a large bowl with a potato masher. Mix in salsa, chile powder, and ground cumin. Spread into a 11x7.5 inch casserole or a similar container, sprinkle on cheese, and heat in the microwave for 3-5 minutes. After the bean dip is hot, add the avocado and tomato. Enjoy with chips, veggie sticks, or pita bread. Macaroni and cheese is one of those foods that is so good that it’s bad. I will definitely try this healthier version - I am not a huge suit cream fan and can easily live without it. i will be making this for the Super Bowl. Love the idea of using chopped avocado instead of guac. A family member cannot have onion, tomato, lime, hot spices, etc. so ours is 5 layer: beans, cheese, smashed avocado with garlic, a smear of sour cream and topped with black olives. Salsa on the side for the rest of us. We don't usually heat up the cheese beans either. My next dip will be heated and have chopped avocado on top! As a California Olive Grower I add black olives to our bean dip! My family also enjoys either finely shredded cabbage or lettuce before the addition of chopped avocado and tomatoes on top. Love this variation! My favorite 3-layer 'dip' is in the mediterranean style- layer of hummus, top with (quinoa) tabouli, add low-fat feta cheese...yum! Try splashing lime juice instead of lemon over the avocado. I find it gives it a more "Mexican" flavor. I do a variation of this dip and squeeze some lime juice into the bean mixture as well. But that might just be my preference. Girl, I made this for Superbowl the first time you posted it, and it has been a family favorite ever since. It's so awesome when something so totally yummy is actually healthy too. Thanks for a great recipe ... as usual! What a great idea. These dips are typically overloaded with calories and because they taste so good, we can't seem to walk away and before we know it we have consumed our daily calories all in one appetizer. This is a great healthy alternative to a side dish everyone loves! And I will definitely be adding jalapenos! Plain Greek yogurt is my sour cream! Follow directions in original recipe mixing lime juice in with beans, salsa and seasoning. Spread bean mixture in to casserole dish, spread a thin layer of sour cream (optional of course), layer on cooked chicken and sprinkle with cheese. Bake at 350 degrees for 20-25 minutes (until cheese is melted and dish is heated thru). 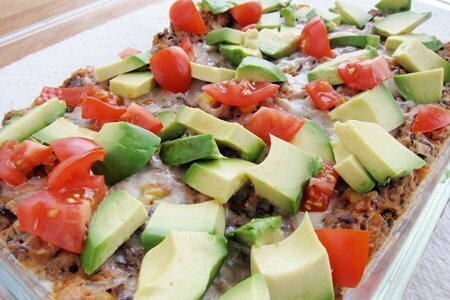 Top with tomatoes and avocados before serving. I dished onto plates and served with warmed wheat tortillas. We folded the tortillas in half and filled them to make soft tacos. Wonderful!